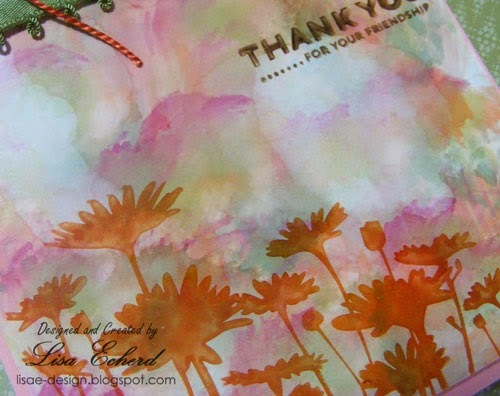 Karen and I experimented with Ranger Alcohol Inks over Easter. We did several cards and some backgrounds. I finished up this background that reminds me of marble the way the colors blend together. I used some of Archival Ink she bought me for my birthday. (Thank you, Karen!) I like the pretty backgrounds we created but haven't decided if I want to invest in the alcohol inks for myself yet. I think I'll have to have a specific project first. I LOVE Ranger Archival Ink pads. These are permanent inks. It is true these will stain your clear stamps. However, I have no collectible clear stamps like CTMH. So none of my clear stamps are ever going to have an after market value. I don't think you can give some of them away on E-bay! You can clean permanent ink off Stampin' Up! stamps which I do resell sometimes. So I'm going to go for the permanent Archival ink from now on whenver they have a color that suits my purposes. The reason is that it stamps so beautifully with any kind of stamp on almost any kind of surface. I can use it for mixed media and then go over with Mod Podge or paint without worry of smearing. I can stamp on this glossy cardstock or transparency film. And of course, I can stamp on plain on cardstock. I used Stazon for years but Archival Ink from Ranger is just so, so much better. I won't get rid of my Distress Inks. They have some fun properties and seem to last a very long time without a refill. So I'm a convert! I won't be getting rid of my Stampin' Up! pads either but I probably won't buy anymore ink from them, just cardstock - always lots of cardstock. What kind of ink is your favorite? I love the Ranger archival inks too. They make such a great impression (on me and on my projects, LOL!) 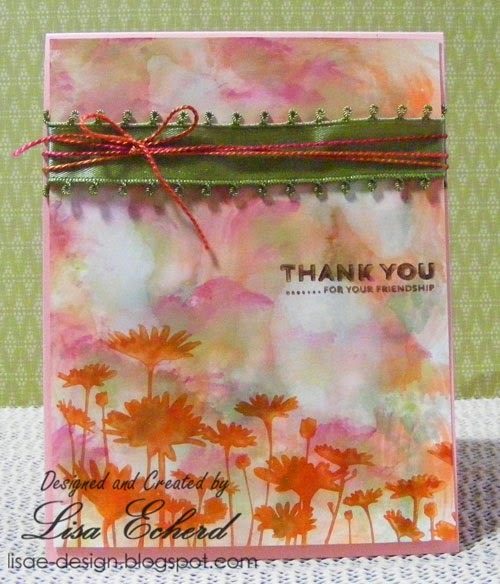 Love this beautiful card! Such a gorgeous card, thanks for the ink suggestions! Glad the ink is working so well for you, Lisa. LOVE the card! Thanks for the mixed media lessons; new works coming soon! Thanks for sharing. Wow, I just learned something new about this ink! I hate smearing when covering a project with Mod Podge. I am loving that background too! First Flight and New e-book!